half of him at least. you have no need for that priest. a centaur is more, of course! The centaur — it is improbable, isn’t it? I’ve tuned into some of the ‘Xena’ and ‘Hercules’ reruns lately on a new channel in the area (I rely on a rooftop antenna for television) and that led me to think upon the mythical creature. It is simply too preposterous and impractical a being for me to ever slip it into my own writing. 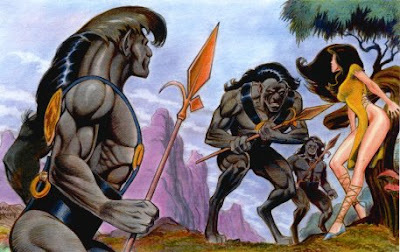 I think Edgar Rice Burroughs had the right idea with his centaur-like ‘Moon Men.’ They have four limbs, not six, with hindquarters similar to a horse wedded to a humanoid upper body. This comic book illustration has them about right. I could see having such a creature inhabiting my fantasy tales. One can envision a logical evolutionary path leading to it. I have done something similar with griffins and other mythical animals in my novels, fitting them into more-or-less familiar family trees. So why not a ‘centauroid’ creature? Maybe in a future book, but only if a need arises.